A Compost Tumbler keeps your composting area tidy and pest free and tumbles up an odor free growing medium with little effort. For easy back yard composting a tumbling composter keeps your pile actively cooking. 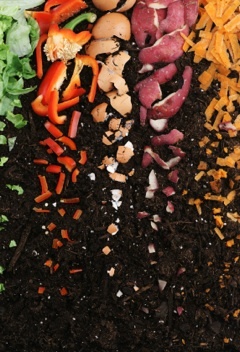 Tumbling composters have several advantages over the age old compost pile, particularly in urban and suburban locales. If you live on a rambling acreage you can probably find an out-of-the-way place to heap your compost materials even without benefit of a composter, but it's a little awkward in a nicely landscaped, postage stamp sized yard. A composting tumbler fits unobtrusively in a corner of a small yard reducing clutter and eliminating vermin attracting piles of open compost materials. Turning the composter daily, without need of a pitchfork or special compost turner, results in an odor free, moist and crumbly growing medium in a few weeks. Tumblers emit no odor and are tidy as well as compact enough to fit in small yards. Additionally, because the tumbling composter is an enclosed unit it discourages pests from hanging around and retains moisture better than open varieties. The tumbling action is achieved by turning the unit with a handle or rotating the entire unit itself depending on the model you choose. This keeps the contents well aerated and incorporated - two of the absolute necesseties for turning out that perfect compost for your ornamental, vegetable or container garden. One thing though. Although promotional materials state that tumblers can produce a finished product in 2 weeks, it has been demonstrated that those claims are a little optimistic. Unless you grate or finely chop the contents before you put them into the composter the rate of breakdown is more like 2 months than 2 weeks. Still, the benefits are noteworthy. The Tumbleweed composter is rated highly among users and is one of the least expensive models of tumbling composter on the market. Applauded for their ease of use, neat appearance and double ended access ports, users agree that the Tumbleweed makes composting easier and tidier. Take it for a test drive in your back yard. Hover over the photo for more information. Visitors to our Compost Tumbler page may also be interested in the following pages.